Introducing our exclusive Eyeko Mascara Wardrobe® featuring all six of our signature award-winning mascaras for every lash look. 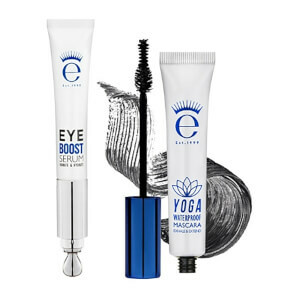 From Eyeko Sport Waterproof Mascara for workout wear to Eyeko Rock Out & Lash Out Mascara for nights out discover a mascara that meets your lash needs and fits your mood. We coined the term Mascara Wardrobe® to describe the use of multiple mascaras to create a variety of dynamic looks to address perfect length, volume, curl and definition. Use individually or mix and match! Presented in a luxe gift box with blinking lenticular eyes, our Mascara Wardrobe is the definitive mascara collection for discerning lash lovers! Includes: Lash Alert Mascara, Black Magic Mascara, Skinny Brush Mascara, Sport Waterproof Mascara, Rock Out & Lash Out Mascara and Fat Brush Mascara. BLACK MAGIC MASCARA INGREDIENTS: Aqua (Water), Acrylates Copolymer, Cera Alba (Beeswax), Ozokerite, Copernicia Cerifera Cera (Carnauba) Wax, Polyglyceryl-3 Methylglucose Distearate, Stearic Acid, 1,2-Hexanediol, Butyrospermum Parkii (Shea Butter), Hydroxyethylcellulose, Magnesium Aluminum Silicate, Triethanolamine, PEG-14M, Isobutylene/Sodium Maleate Copolymer, Microcrystalline Wax, Phenyl Trimethicone, Phenoxyethanol, Propylene Glycol, Silica, Simethicone, Butylene Glycol, Polysorbate 60, Chlorphenesin, Dimethicone, Disodium EDTA, Hydrolyzed Keratin, Oleth-10, Pentaerythrityl Tetra-Di-t-Butyl Hydroxyhydrocinnamate. May Contain: CI 77499 (Iron Oxides), CI 77266 (Black 2). 8ml 0.29fl oz. Created in London. Made in S. Korea. SKINNY BRUSH MASCARA INGREDIENTS: Aqua (Water), Acrylates Copolymer, Cera Alba (Beeswax), Hydrogenated Rapeseed Oil, 1,2-Hexanediol, Cetearyl Alcohol, Copernicia Cerifera (Carnauba) Wax, Butylene Glycol, Isobutylene/Sodium Maleate Copolymer, Octylacrylamide/Acrylates/Butylaminoethyl Methacrylate Copolymer, PEG-40 Stearate, Silica, Triethanolamine, Stearic Acid, Glyceryl Stearate, PEG-100 Stearate, Phenoxyethanol, Phenyl Trimethicone, Montmorillonite, Hydroxyethylcellulose, Chlorphenesin, Dimethicone, Simethicone, Panthenol, Polysorbate 20, Disodium EDTA, Potassium Hydroxide. MAY CONTAIN: CI 77499 (Iron Oxides). 8ml 0.29fl oz. Created in London. Made in S. Korea. LASH ALERT MASCARA INGREDIENTS: Aqua (Water), Acrylates/ Ethylhexyl Acrylate Copolymer, Cera Alba (Beeswax), Butyrospermum Parkii (Shea) Butter, Microcrystalline Wax, Copernicia Cerifera Cera (Carnauba) Wax, Stearic Acid, 1,2-Hexanediol, Polyglyceryl-3 Methylglucose Distearate, Magnesium Aluminum Silicate, Polyvinyl Alcohol,Triethanolamine, Isobutylene/Sodium Maleate Copolymer, Silica, Phenoxyethanol,Phenyl Trimethicone,Simethicone, Nylon-6, Dipropylene Glycol,PEG-40 Hydrogenated Castor Oil,Chlorphenesin, Dimethicone, Hydroxyethylcellulose, Disodium EDTA, Laureth-21,Alcohol, Magnolia Officinalis Bark Extract, Pentaerythrityl Tetra-Di-t-Butyl Hydroxyhydrocinnamate, Allium Sativum (Garlic) Bulb Extract, Camellia Sinensis Leaf Extract, Houttuynia Cordata Extract, Perilla Frutescens Leaf Extract, Perilla Ocymoides Seed Extract, Polygonum Multiflorum Root Extract, Arginine, Caffeine, Sodium Dehydroacetate,Angelica Gigas Root Extract, Apigenin, Astragalus Membranaceus Root Extract,Atractyloides Japonica Rhizome Extract, Biotin, Biotinoyl Tripeptide-1, Butylene Glycol, Cinnamomum Zeylanicum Bark Extract, Cnidium Of cinale Root Extract, Ethylhexylglycerin, Glycyrrhiza Glabra (Licorice) Root Extract, Oleanolic Acid, Paeonia Albiflora Root Extract, Panax Ginseng Root Extract, Poria Cocos Extract, PPG-26-Buteth-26, Rehmannia Chinensis Root Extract, Iron Oxides (CI 77499), D&C Black No. 2 (CI 77266). Created in London. Made in S. Korea. FAT BRUSH MASCARA INGREDIENTS: Aqua (Water), Acrylates Copolymer, Cera Alba (Beeswax), Hydrogenated Rapeseed Oil, 1,2-Hexanediol, Cetearyl Alcohol, Copernicia Cerifera (Carnauba) Wax, Kaolin, Butylene Glycol, Isobutylene / Sodium Maleate Copolymer, Octylacrylamide / Acrylates / Butylaminoethyl Methacrylate Copolymer, PEG-40 Stearate, Trehalose, Triethanolamine, Stearic Acid, Glyceryl Stearate, PEG-100 Stearate, Phenoxyethanol, Phenyl Trimethicone, Montmorillonite, Hydroxyethylcellulose, Polysorbate 60, Chlorphenesin, Dimethicone, Nylon-6, Silica, Simethicone, Oleth-10, Polysorbate 20, Disodium EDTA, Potassium Hydroxide. MAY CONTAIN: CI 77499 (Iron Oxides), CI 77266 (Black 2). SPORT WATERPROOF MASCARA INGREDIENTS: Isododecane, Trimethylsiloxysilicate, Aqua (Water), Beeswax, VP/Eicosene Copolymer, Silica, Alumina, Copernicia Cerifera (Carnauba) Wax, Cetyl PEG/PPG-10/1 Dimethicone, Disteardimonium Hectorite, Ethylene/Propylene Copolymer, Polyethylene, Butylene Glycol, Magnesium Sulfate, Hydrogenated Polyisobutene, Sorbitan Isostearate, Propylene Carbonate, Potassium Sorbate, Phenoxyethanol, Nylon-66, Triethoxycaprylylsilane, Cyclopentasiloxane, Ceramide 3, Tocopheryl Acetate, Hydrolyzed Collagen, Glycerin, Sodium Polyacrylate, Palmitoyl Myristyl Serinate, PEG-8, PEG-8/SMDI Copolymer, Lycium Chinense Fruit Extract, Vaccinium Macrocarpon (Cranberry) Fruit Extract, Rubus Idaeus (Raspberry) Fruit Extract, Morus Nigra Fruit Extract, Ribes Nigrum (Black Currant) Fruit Extract, Vaccinium Angustifolium (Blueberry) Fruit Extract, Rubus Fruticosus (Blackberry) Fruit Extract, Euterpe Oleracea Fruit Extract (Acai), Rubus Coreanus Fruit Extract (Black Raspberry), Vaccinium Myrtillus Fruit Extract (Bilberry), Aristotelia Chilensis Fruit Extract (Wineberry), Ethylhexylglycerin. MAY CONTAIN: CI 77499(Iron Oxides), CI 77019 (Mica), CI 77891 (Titanium Dioxide). 8ml 0.29fl oz. Created in London. Made in S. Korea. ROCK OUT & LASH OUT MASCARA INGREDIENTS: Aqua (Water), Acrylates Copolymer, Acrylates / Ethylhexyl Acrylate Copolymer, Cera Alba (Beeswax), Butylene Glycol, Copernicia Cerifera (Carnauba) Wax, Stearic Acid, Hydrogenated Polyisobutene, Cellulose, Tribehenin, Glyceryl Stearate SE, Cetearyl Alcohol, Sorbitan Stearate, Polysorbate 60, Alcohol Denat, Montmorillonite,Tromethamine, Phenoxyethanol, Glyceryl Behenate, Glyceryl Dibehenate, Methylglucamine, Simethicone, Laureth-21, Sodium Polyacrylate, Silica, Myristic Acid, PEG-40 Hydrogenated Castor Oil, Etylhexylglycerin, Disodium EDTA, Sodium Dehydroacetate. MAY CONTAIN: CI 77499 (Iron Oxides), CI 77266 (Black 2). 8ml 0.29fl oz. Created in London. Made in S. Korea. 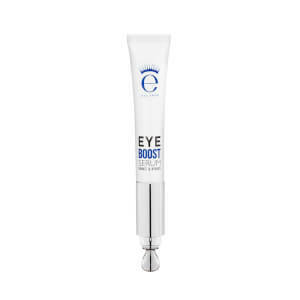 I have used Eyeko for the past 3 years and I love the quality, formula and choice. I like to use different mascara for different occasions and the wardbrobe gives you lots of options. It's also good for gifting mascara to your friends. If you can bear to give any away. I also like the other products. Eyeko is my go to for eyebrow products and mascara. These really are the ultimate in luxury. Different types of mascara to try which give your lashes different looks. Great brushes that capture every lash. Lovely carbon black pigment. What more could you want? Another box of beautiful mascaras of course! 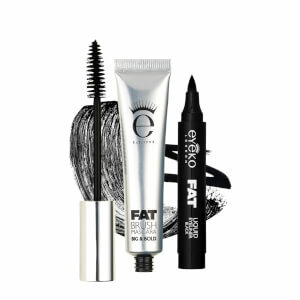 I got a voucher on an airline for Â£20 because my screen wouldn't work on a long flight, browsing thru the in flight magazine I found 2 Eyeko mascaras....I have never looked back and have 4 mascara wardrobes in my wardrobe, I cant live without them!! I am 60 and the old lashes are a bit sparse but my eyes are my best feature so I don't mind at all splashing out on these. They are far nicer and now (if on offer) often cheaper than more "ordinary" makes from a high street store. They all remove easily, yet NEVER run separate the lashes, add depth and definition to every lash and a choice of brushes in the set. My fave has to be Skinny, I just love the brush! So in essence, my tv on the plane was no good for my eyes..YET Eyeko is! That's the irony. This mascara wardrobe is so good because it has 6 different types of mascaras. If you have a friend that needs different mascaras for different occasions, this is the product you need. 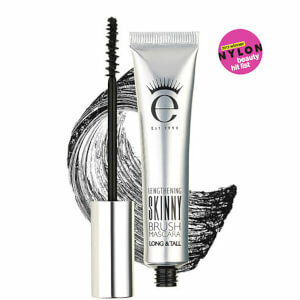 Been loving Eyeko for years now, my husband buys me this every Xmas!